The Conservative Party has insisted it will not reveal the names of 10 wealthy backers whose loans have been repaid. But it is promising to pass details of eight of them "in confidence" to the Electoral Commission. The other two lenders signed clauses preventing their names being disclosed to anyone. The party is seeking legal advice in an attempt to overturn this. The Conservatives still owe £16m to 13 more supporters who helped bankroll the last general election campaign. Party chairman Francis Maude said the £5m had had to be paid back to those who wished to remain anonymous. He added that he "regretted" that some of the loans had come from abroad. Donations from foreign nationals are illegal, but not loans. The party's biggest individual lenders are former treasurer Lord Ashcroft, with £3.6m, and Lord Laidlaw, with £3.5m. The Conservative Party owes £37m in total, having borrowed nearly £16m from a bank to buy the freehold on its former headquarters in Smith Square and £4.7m from local associations. The Electoral Commission is calling for more detailed information about loans from all political parties. Labour published its own list - totalling nearly £14m - nearly two weeks ago, following claims - denied by Tony Blair - that it was selling peerages. However, Science Minister Lord Sainsbury said there had been some confusion over a £2m loan he made to the party and a separate £2m donation a month earlier. The Liberal Democrats borrowed £850,000 from three wealthy supporters before the last election. The Electoral Commission welcomed the Tories' decision to publish a list of outstanding loans, but said it had asked for more details on the terms. Labour chairman Ian McCartney said the party still looked like it had "something to hide" by not revealing the identity of foreign lenders. "We need to know who these people are, where they reside, where they pay tax, how much they lent and on what terms," he said. 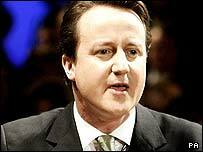 Conservative leader David Cameron is due to meet Mr Blair on Tuesday to discuss the issue. Mr Cameron has published a package of proposed reforms, including a £50,000 cap on individual donations, additional state funding and a ban on non-bank loans. Meanwhile, a Metropolitan Police investigation into "cash for peerages" allegations, which initially focused on Labour, has widened into a cross-party inquiry.